Bad News: Compared to Deadmau5, Worship is Boring. The other week, I logged into Spotify, and on the main page they were live streaming the Made in America concert hosted by Jay-Z. I watched for a few minutes at the bizarre display. 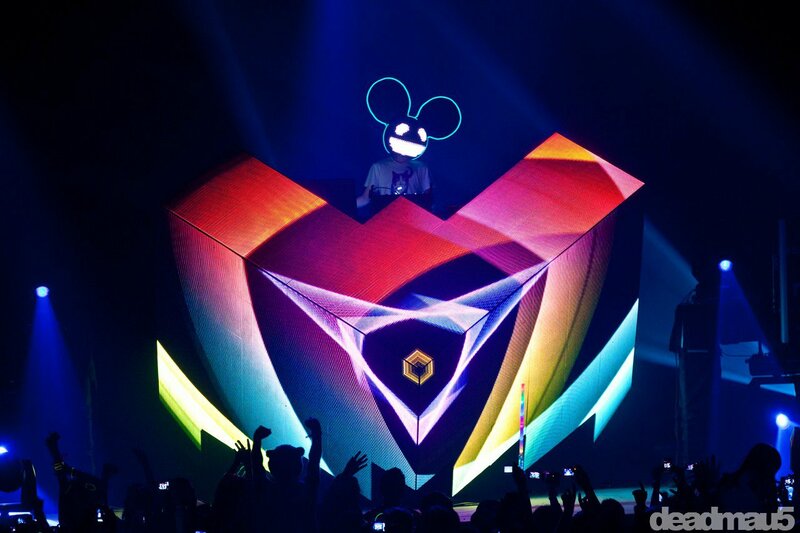 Deadmau5 was performing–a DJ who makes dance/trance music for the mainstream. As a DJ, the main draw of his performance was not the actual performing, he just sort of swayed and bobbed behind his DJ booth sometimes wearing his giant mouse head, sometimes not. No, his show was all about the wild LED screens splashing bizarre bits of pictures, pixels, and exploding color while he mixed beats and tried to work the crowd into a hypnotic ocean of rhythm. As I’m watching this performance, the cameras would periodically pan over the large crowd gathered at the outdoor venue, and I was struck by a very familiar sight. I will admit there were a couple of enthusiastic fans who bounced and jived to the throbbing bass the entire hour or longer performance, but for the most part, this is what I saw: unimpressed teens and twenty-somethings. Here they were at the most cutting-edge display of visual effects to be found on the planet, and for the most part, I saw a generation of men and women (most just barely younger than me) whose expressionless faces said it all. Some waved their hands or bobbed their heads patronizingly, but most were either talking to their mates or were on their phones, totally disengaged from the concert. I say this is a familiar sight, because I have seen this happen in so many worship services I have attended. The kids are unimpressed. Compared to a Deadmau5 concert, any worship service’s light show or music is going to be a complete and total bore. Now, if these students find Deadmau5 to be a yawn after 5 or so minutes, how on earth can we as worship leaders and pastors compete for their attention? How can we be more entertaining than their phones or the best concert they have ever been to? We can’t. Today’s generation is so over stimulated that they aren’t even excited by immense flashing screens, pumping beats, and a dancing mouse man on stage. So, quit trying. I don’t mean quit trying to lead worship; I mean quit trying to compete with all of the stimulating entertainment out there. When our churches try to compete with the top-shelf production of the entertainment culture, we will always fall woefully short. The result will always be the same: been there, seen that, don’t care…back to the phone. In our corporate worship services, we have something to offer that far surpasses the sensual experiences that have numbed so many of this generation’s eyes and ears into passive disinterest. When the body of Christ comes together, the presence of God descends. The very presence of the Creator of the Universe comes down to commune with His people. Paul writes to the Corinthians, “Do y’all not know that y’all are God’s temple and that God’s Spirit dwells in y’all? If anyone destroys God’s temple, God will destroy him. For God’s temple is holy, and y’all are that temple” (Southerner’s Bible). And elsewhere in 2 Corinthians he writes, “For we are the temple of the living God; as God said, ‘I will make my dwelling among them and walk among them, and I will be their God, and they shall be my people'” (2 Cor. 6:16-17). Paul’s point is that the church is now the dwelling place of God. Just as the temple in the OT celebrated the special presence of God, now the church welcomes the special presence of their God when they come together to worship. We are the temple; His dwelling is with us, His people. Perhaps one of the worst things we can seek to communicate about our corporate services is that it is just like our everyday life. I understand that the motive is to make people feel welcome and comfortable, but in doing so we eliminate the only thing we have to offer in corporate worship: the presence of the living God. God’s presence is with His people in a special way when they gather to worship. Light shows, explosive beats, and entertainment media do a great job of distracting us from this fact. The awe inspiring presence of the Almighty God is unfathomable, and it cannot be found at a concert, on YouTube, or Facebook–only among His people, the church. At our church, I am trying my best to make our people aware of the fact that something truly spiritual is happening, as we come together to commune with our God. We cry out to Him with our singing and prayers, and He speaks to us through His Word read and preached. Anything that distracts from this reality deadens our senses to the very real presence of the Almighty God. Somewhere lost in all of our explosive music and light display and videos there is the soft whisper of our God. Make sure His people are able to hear Him. haha looks like a Disney channel rave! Good blog, especially to those that are trying to compete with that pop culture. On the other hand, there is a generation of people who have a hard time connecting with God through organ music and typical CCM…just talked with someone today who said he was super distracted by the lack of excellence that a worship team put into their worship…also he was distracted by hand clapping(which for some reason became something you do during every CCM song lol), and talked with someone yesterday that said they were distracted from connecting with God through the old music and hymns. I think a worship leader must be led by the spirit in how to best connect with the people God wants to reach through the corporate worship service they are leading. In the old days stained glass was basically the LED displays of old, made to tell the story of the Gospel in pictures and bright colors. They created the sanctuary’s to let light in and proclaim the glory of God! Then it just became something you do and everybody forgot the why’s! The organ made it’s way into corporate worship fighting as hard as the electric guitar and drums…lots of opposition and the heart behind it was to proclaim the Glory of God! Another thing I think we are missing in our contemporary and non contemporary worship services is what you hit on at the end…space! We are so programmed that we have no space for God to speak in the whisper! I have rarely been to a service that didn’t jump from song to written prayer to scripture reading to song to message…leaving 13 seconds for your private personal confession to God! I know I’m called to reach the next generation, so when I create a worship environment I seek God for the best way to connect with them and paint the clearest picture of God without distractions…on a weekly basis! Sometimes that comes in the form of LOUD music…because I’ve found that sometimes people don’t have the best singing voices, and so they won’t sing their hearts out to God if the music is soft and everyone will hear them. Sometimes it comes in the form of a quiet intimate acoustic service close together, just pushing in to the spirit. Sometimes it comes through opening with a Pop song that, whether it knows it or not, is telling peoples spiritual stories and struggles. Then it services as a double purpose, it makes people far from God feel comfortable because they know we are in their world with them, and it gives us the opportunity to be like Paul and say…just as some of your own poets have said…but let me tell you who this unknown God is!! All of that to say, I think one of the biggest challenges that modern day worship leaders face is, not doing things just because that’s what we do…not trying to fit in or be something we’re not…but leaning into God’s whisper for ourselves and listening to what and how He wants to proclaim His glory each time we gather! Thanks for your thoughts, Eddie! It’s important that we don’t advocate styles of worship simply because they are traditional or new. Instead we have to do the hard thinking to try to figure out how we can help the church of our generation worship God according to His Word. Always appreciate your thoughts!